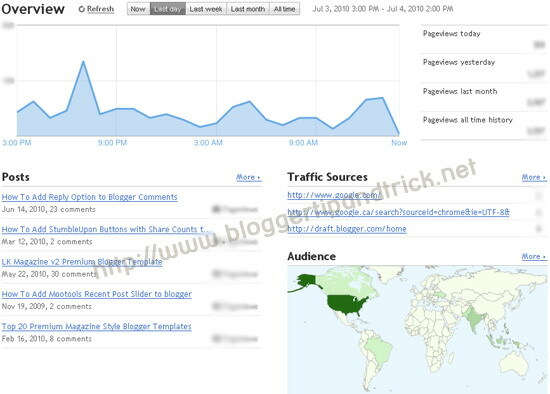 Few days ago, Blogger, has introduced a full-featured, real time stat service for your blogspot blog.The new Stats feature shows all traffic stats data of your bloggger blog, in a simple, easy-to-understand graphical user interface. So now you can check traffic stats of your blogger blog without using any third party services.You have nothing to install or configure.It monitors and analyzes your visitor traffic in real time, which technically is not possible with other tools, not even in Google Analytics. This new feature will helpful to all blogger users to know what's going on with your blog right now.As a blogger I am very happy with this new feature of blogger. really nice. waiting for it..